Each year 5-7 thousand women and girls, including boys are trafficked from Bangladesh. They are taken through India to Pakistan and Middle Eastern countries for cheap labours and prostitution. In a joint effort with Bangladeshi NGOs, SLARTC has organised 3 border area posts for checking the trade. One is at Basirhat in North 24 parganas, where Ghojadanga is the official border on the Indian side, where as Bhomra at Satkhira district is the border on the Bangladesh side. The second border post of SLARTC is at Banpur near Gede in Nadia district on the Indian side and Kustia on the Bangladesh side. The third is Bhagobangola in Murshidabad district on the Indian side and Chapai Nababgunj and Rajsahi on the Bangladesh side. All these 3 district panchayats have been chosen by SLARTC. Here in 5 panchayats (local self government), sensitisation is carried out for panchayat members, school teachers, youth, local NGOs, police and others, regarding human trafficking, safe migration and HIV / AIDS. Tea stall meetings and village level meetings are organised in each of these areas. SLARTC is trying to develop a vigilance group that will keep a watch on the migrants, as well as keep a tab on unsafe migration through local touts. People involved in migration generally take shelter in the border villages before being taken to other Indian towns or cities. By keeping tab, these migrating people can be traced when brought to India. 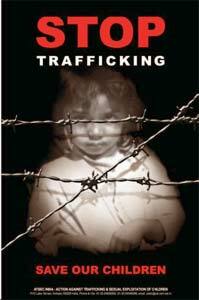 If intervention takes place at this stage, police, border forces and NGOs can rescue many trafficked persons. Like SLARTC, NGOs in Bangladesh are also doing similar work where they have Association for Community Development at Rajsahi, Rights Jessore, Rupantor in Khulna, Dhaka Ashania Mission and BNWLA. SLARTC is looking after legal cases of the trafficked persons in different courts of law in West Bengal. As per the order of the court of law, the released persons are repatriated to Bangladesh with the help of Home Department and the Directorate of the Social Welfare, Gov. Of West Bengal. Generally BNWLA receives the repatriated girls at the border with the help of BDR.